A large part of the Italian welfare system is designed and implemented at the very local level, leading to a high degree of heterogeneity in the type and the generosity of available programs across the country. As a consequence, studies of welfare use based on standard household surveys may fail to consider a large part of welfare recipients and provisions. 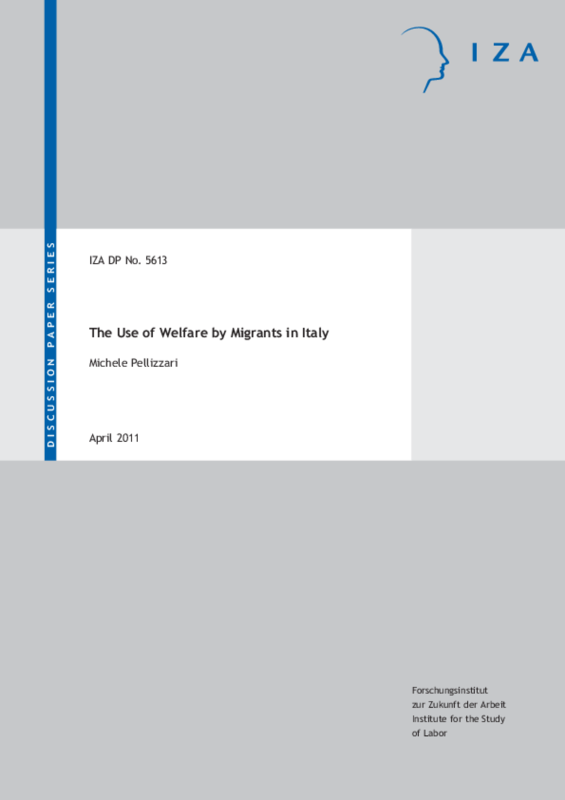 In this paper I overcome such a problem by combining the analysis of welfare use in the Italian sample of the European Survey of Incomes and Living Conditions (EU-SILC) with theinvestigation of a new administrative archive that contains information on means tests certificates needed for applying to all kind of locally administered welfare programs. Results show that, without controlling for observable characteristics, migrants from outside the EU are more likely to receive or apply for welfare. Once individual and household characteristics are controlled for, such a residual welfare dependency is greatly reduced but does not disappear Geographical location is a key factor, given that migrants tend to locate in therichest areas of the country, which also happen to be the ones where the local welfare is most generous. Copyright 2011 Institute for the Study of Labor (IZA).